The new 2015 Australian Silver Kookaburra features a new depiction of the iconic adult kookaburra sitting on a tree stump and surrounded by eucalyptus leaves and a fern. Kookaburras are indigenous to Australian and nearby New Guinea. They are large terrestrial tree kingfishers and are easily recognizable by their call which is typically described as sounding like loud human laughter. 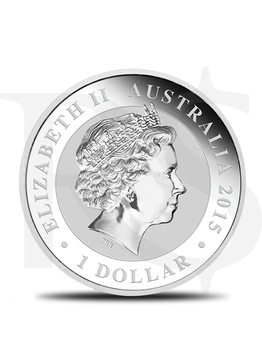 Obverses of the new Kookaburra Silver Bullion Coins contain the Ian Rank-Broadley effigy of Her Majesty Queen Elizabeth II. Obverse inscriptions include "Elizabeth II," "Australia" and the legal tender face value of the coin. Australian Kookaburra Silver Bullion Coins ship in protective acrylic capsules and only 500,000 mintage.